An estimated 600 million children will be living in areas where water demand far outstrips supply by 2040, according to a UNICEF, reports NaijaAgroNet. This, UNICEF also said reflects that 1 in 4 children worldwide will be suffering from water scarcity in the next 23 years. 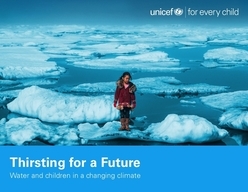 UNICEF, NaijaAgroNet noted in the report entitled, Thirsting for a Future: Water and children in a changing climate, looked at the threats to children’s lives and wellbeing caused by depleted sources of safe water and the ways climate change will intensify these risks in coming years. UNICEF Executive Director, Mr. Anthony Lake said that water is elemental; without it, nothing could grow. “But around the world, millions of children lack access to safe water -- endangering their lives, undermining their health, and jeopardizing their futures. This crisis will only grow unless we take collective action now,” said. According to the report, 37 countries, including Nigeria, are currently facing extremely high levels of water stress, which occurs when more than 80 per cent of the water available for agriculture, industry and domestic use is withdrawn annually. Warmer temperatures, rising sea levels, increased floods, droughts and melting ice affect the quality and availability of water. For Nigeria, the greatest challenge, NaijaAgroNet gathered, is the availability of physical infrastructure to harness rainfall and ground water effectively. UNICEF’s Chief of Water, Sanitation and Hygiene, Kannan Nadar, pointed out that there are huge variations in rainfall between north and south Nigeria, making it all the more important to better plan and manage water resources to minimise the impact of floods and drought. “In Nigeria, as we work towards achieving the Sustainable Development Goal of reaching everyone with access to safe, functional, affordable and accessible water, we must manage water resources more efficiently to meet the needs of Nigeria’s growing population and economic development,” Nadar said. NaijaAgroNet recalled that population growth, coupled with increased water consumption, and higher demand for water largely due to industrialization and urbanization, are draining water resources worldwide. Conflicts in many parts of the world also threaten children’s access to safe water.